Maria Lenk Aquatics Centre pool. Left: August 6th. Right: Today. 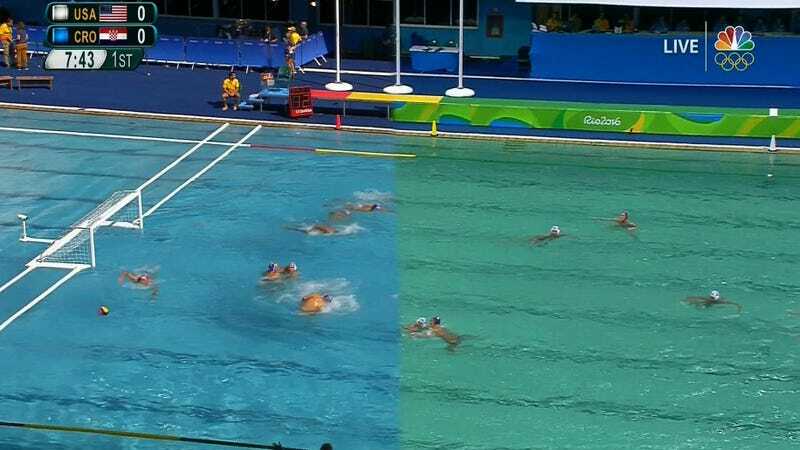 Algae bloomed overnight in the diving pool at Rio’s Maria Lenk Aquatics Centre, and it was only a matter of time that it spread to the competition pool next door—which, from watching today’s water polo action, it has. Olympics organizers insist the bacteria are entirely harmless, though as we noted yesterday the sub-sanitary conditions that allow for that kind of sudden bloom make us question what other biohazards are lurking in the Olympics venues.